Apex is outstanding one page portfolio WordPress theme best fit for portfolio websites, creative agencies, freelancers, photographers and such a similar sites. 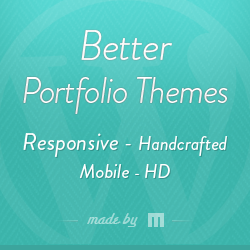 Apex portfolio theme built using on twitter Bootstrap 3 framework with 100% responsive layout looks awesome and best for kind of gadget displays. Apex has 6 built in colour themes and integrated with Ditty Posts Ticker WordPress plugin handy to add custom news tickers to your site either through shortcodes, direct functions or with custom Widgets. Apex one page portfolio WordPress theme has has powerful theme options panel with 5 different blog post types templates and included with custom designed cool icon packs. Compatible with contact form 7 plugin and its cross browser compatible WordPress theme enabled with 600+ google web fonts.